Alcala point in Porlier Pass is accessed by boat from either Chemainus or Ladysmith, though some shore diving is possible from Galiano Island. This amazing piece of water lies between Valdes and Galiano Islands, and is to be treated respectfully, with regards to extreme currents. Follow the above link, select the correct year, select Current Tables, select Volume 5, select Porlier Pass, then choose your day/s and time/s to dive here accordingly. There are a few shallow bays near Alcala Point that are fine for mooring while you dive this site. If you are planning shore diving in Porlier Pass, BC Ferries stops here. But boat diving is best for this piece of water! The best way to do this dive is on the slack and just before the water turns to head out of Porlier Pass towards the Straight of Georgia. current will carry you back to where you started. Again I want to remind you, use a guide and make sure you understand that the tide change / current change are related but not the same. Be very attentive to your buoyancy as there are hundreds and even thousands of sea urchins on this dive. As you probably know, it is way easy to ventilate either yourself or your suit. 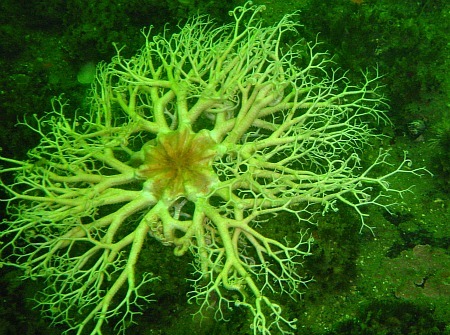 We got a few good pictures of a basket star while diving there, and apparently these high current areas are the few places where you can see these interesting aquatic life forms. There are also many more interesting species to see and photograph as well on this dive, so make sure to bring your camera. You will often see large marine mammals like sea lions that frequent the pass, as they are there for the good fishing available. There is also a possibility of seeing killer whales, as they are frequent visitor's that often travel these fish abundant waters. No matter what, if you dive in Porlier Pass you will be forever sold on cold water scuba diving, and amazed by the amount of marine life found at these high current sites surrounding Vancouver Island.